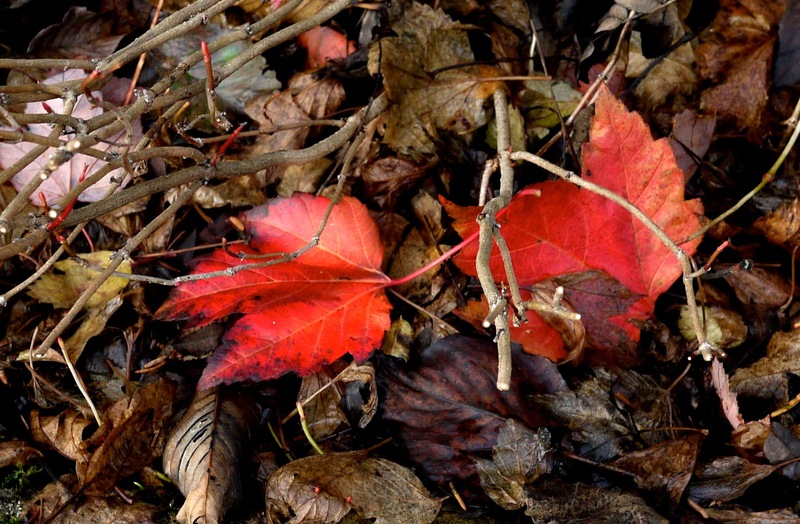 could never describe a maple’s dying leaf. gold, and chartreuse could provide more clues. android green, apple green, and for irony, bud green. to be animated by light. 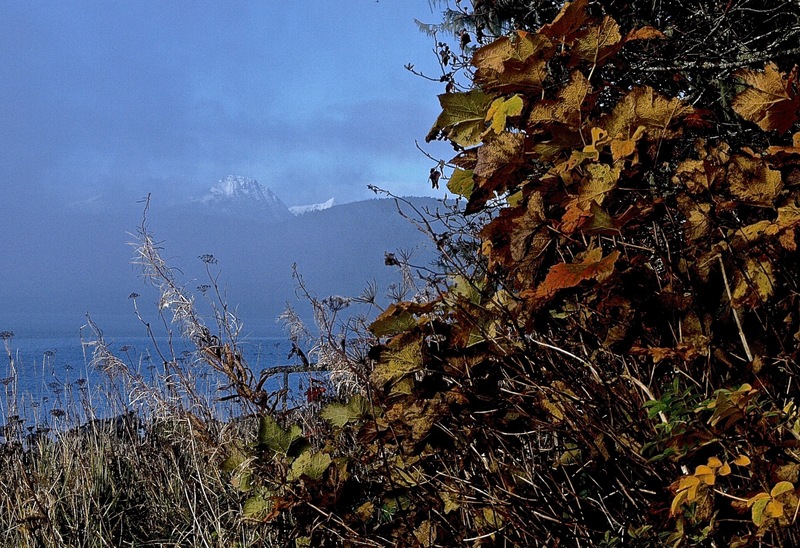 This entry was posted in Dan Branch, Juneau, Nature, Poetry on October 29, 2014 by Dan Branch. Aki and I are out to wrack more seaweed. She wanders near the car while I walk over to the top of a low bluff to check a pocket beach. A cabal of ravens scatters into the air when I reach the bluff edge. 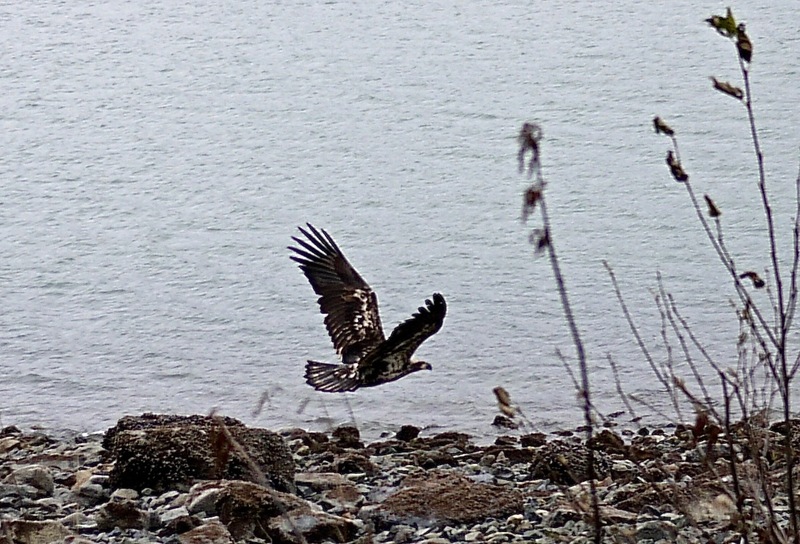 Still hunkered on the beach, an immature bald eagle doubles its apparent size by forming parenthesis with expanded wings. I have time to notice how his umber body is spattered with white feathers before he flies to roost in a nearby Spruce. 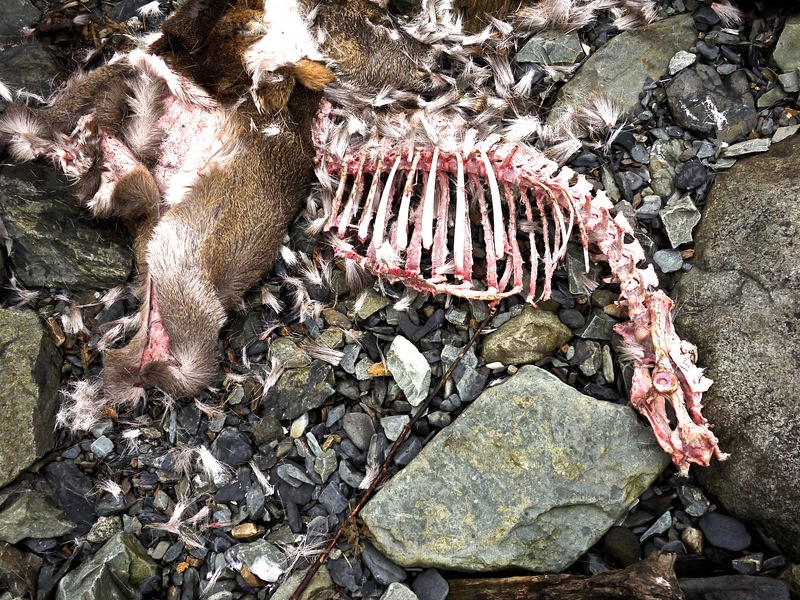 The birds have left behind a deer carcass. The severed deer head, without antlers or eyes rests on the hind withers. Birds have pealed back the thick brown coat to expose the intact bone structure of the back, ribs, and neck. The fur lies like a rumpled blanket over the deer’s hindquarters. Scavengers have consumed the internal organs and picked the uncovered bones clean of most of their meat. The bones have a durable beauty, especially the symmetrical curving ribs and long bend of the neck. I try not to acknowledge how human the rib cage looks from the side. Instead I remember watching a deer swim toward this beach followed by a sea lion. The deer made the beach just before the sea lion and stood panting, head bent low between the kayaks we were about to launch. Why did I find you now, when I just finished reading the deer-hunting essay from Nelson’s The Island Within? Seeing deer hunting as an offering, not a taking, Nelson showed nothing but respect when cleaning the deer that have given itself to him. Unless it died of natural causes, I fear that who ever shot this deer wasted most of the meat. The eagle and ravens complain about our presence at their precious find. They will return to their picking as soon as we leave, gently pushing back the blanket of fur to expose more and more flesh, devouring the exposed until only scavengers with smaller tools will be able to continue the harvest. It is this scavenger’s communion that will salvage meaning from the deer’s death. 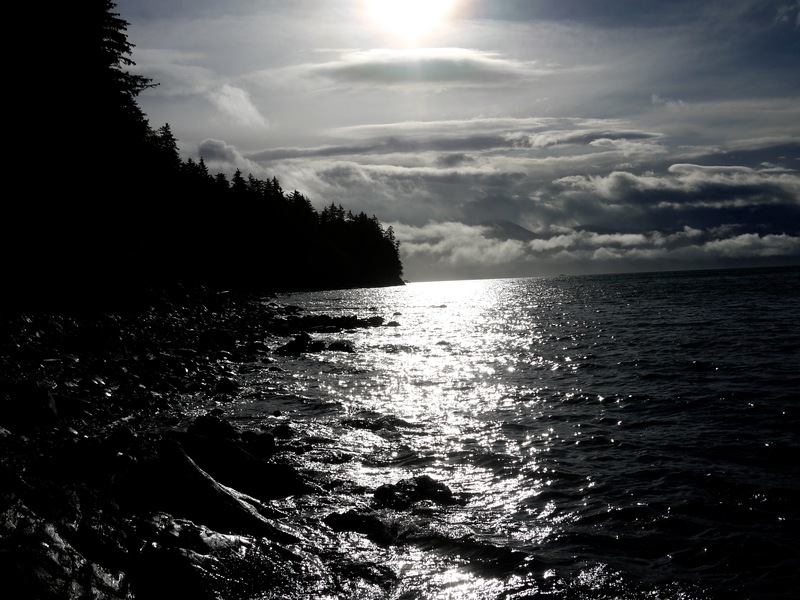 This entry was posted in Aki, Dan Branch, Juneau, Nature, Southeast Alaska on October 28, 2014 by Dan Branch. 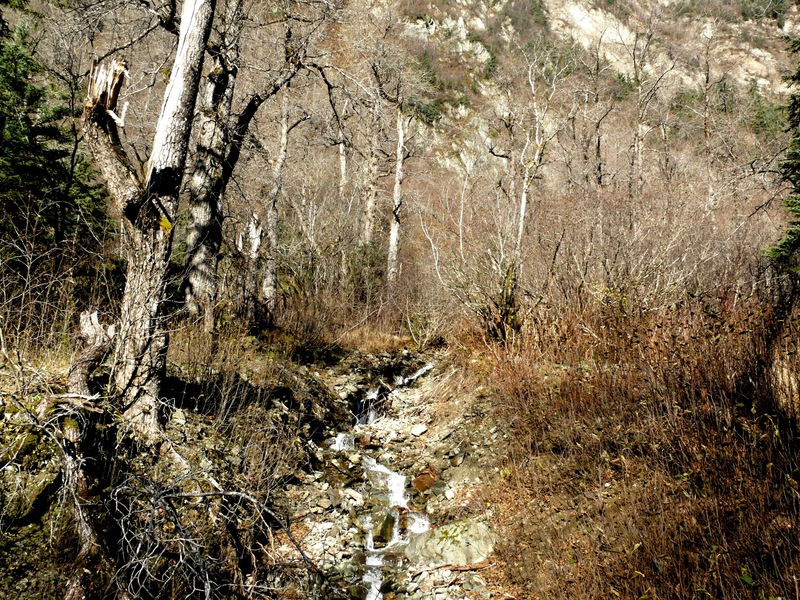 Walking a creek valley bounded by two mountain walls on a sunny day can be frustrating. Aki and I are in shadow, sliding along an informal trail. We cross a leafy bench big enough to accommodate one troll family or a village of hobbits. The little dog seems to be searching for evidence of both. Sunlight is doing some special things to Mount Juneau on our left, intensifying the red and yellow of dog wood leaves and spotlighting bare cottonwoods. Low angled light underlines their longest limbs in shadow as they reach to the south. I start singing, “They are leaning out for love and they will lean that way forever.” Aki stares as if she can see the Leonard Cohen ear worm enter my brain. I sing about Suzanne, with her tea and oranges all the way from China as we climb up the trail and into the sun. 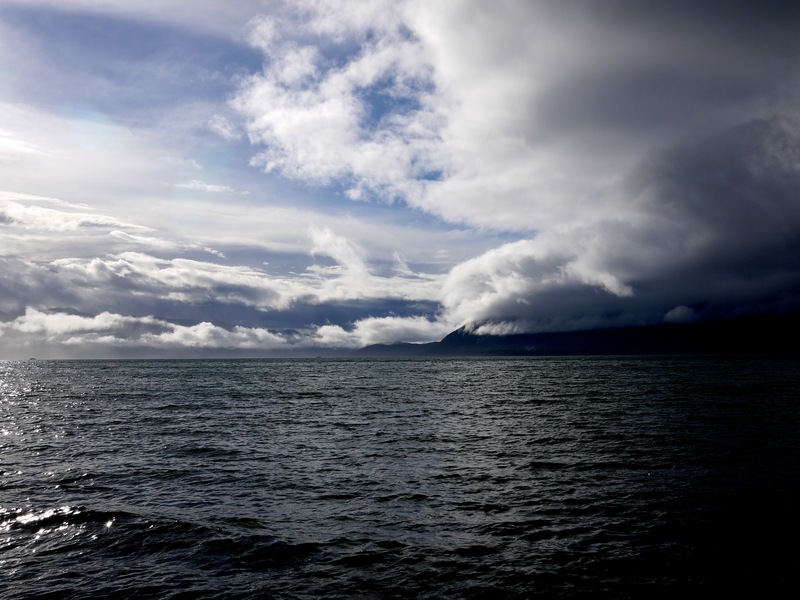 This entry was posted in Aki, Dan Branch, Juneau, Nature, Southeast Alaska on October 27, 2014 by Dan Branch. Autumn lingers on in the rain forest. Green leaves still cling to some of the understory plants and we found blooms on meadow strawberries. The devil’s clubs got the memo. Their leaves have turned limp enough to hang like wet paper from the plant’s thorny stalks. We find a few leaves on riverside cottonwoods but most of the tall trees have cast off their yellow growth. While winter delayed fools the plant life, it hasn’t encouraged birds or animals to stay here. The great runs of salmon that pulse up the river set the calendars of eagle, wolf, and bear. Even with the last run of silver salmon now on the upriver spawning beds, I had expected to see eagles and ravens on the river. 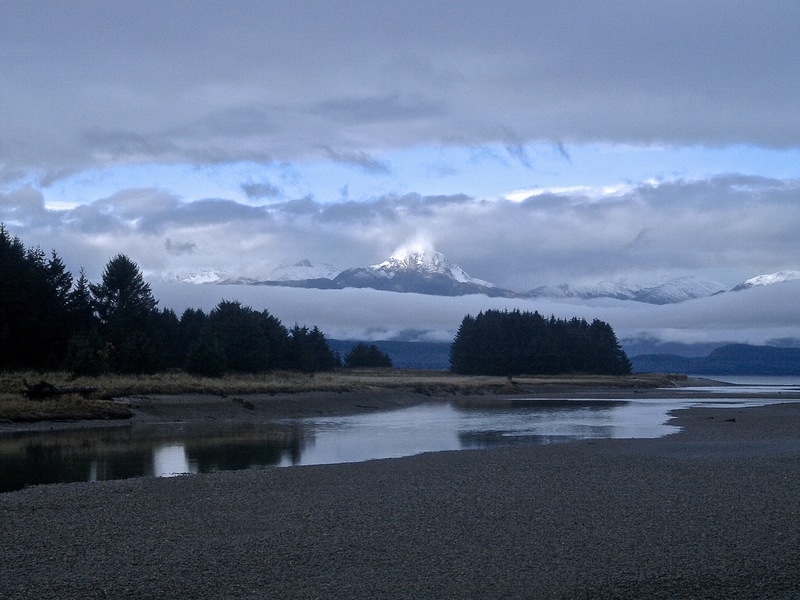 The eagles must have flow 100 miles north to the braided Chilkat River where a late run of salmon will supply them with food. No telling about Raven. Normally, I’d be impatient with lingering fall. But this year, its moist grey blanket soothes. After turning our back on the river, we move through the old growth forest, silent except for lecturing squirrels (Aki’s enemies) and the crunch of my boots on leaves. 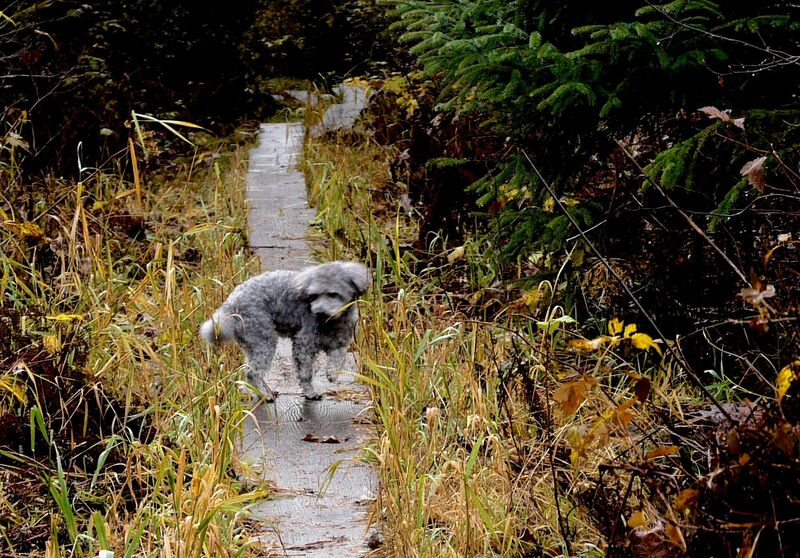 It’s raining but we don’t feel the drops until Aki shoots out onto the boardwalk that crosses a muskeg meadow. Here the rain falls in thick drops spaced far enough apart for a mosquito to pass through without getting wet. A shaft of sunlight rips through the overcast to turn the drops into prisms. Aki hunkers by my side during the lightshow. I expect a chorus line of coyotes to dance down the boardwalk on their hind paws or at least a unicycle-riding bear. 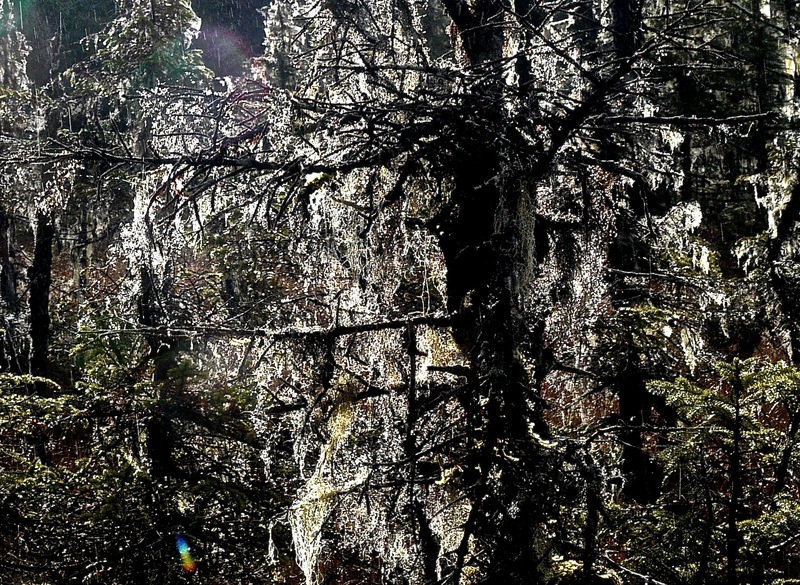 But we have only sparkling drops trapped in old man’s beard and electrified moss. 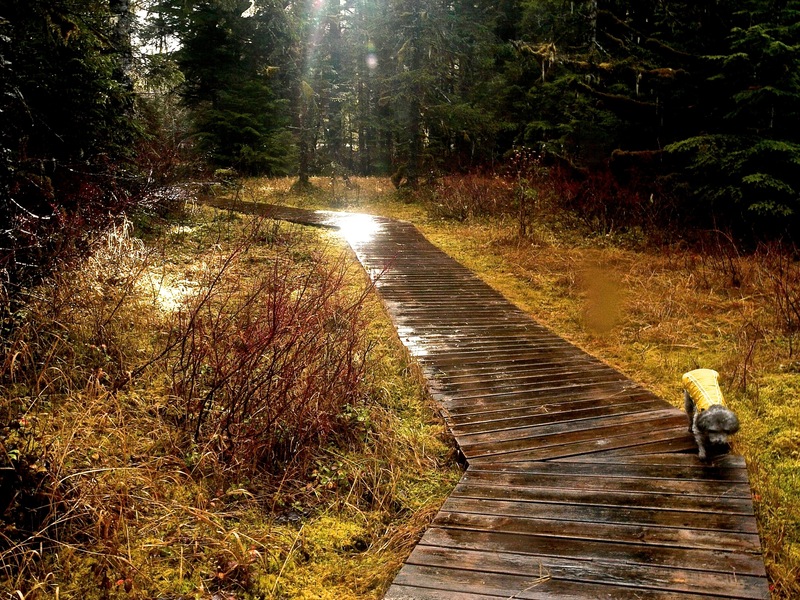 This entry was posted in Aki, Dan Branch, Juneau, Nature, peaceful isolation, Southeast Alaska on October 26, 2014 by Dan Branch. Gulls and ducks squabbled in fog that obscured everything but the near sections of the beach. In such a world of almost total grey, displays of color from the tail end of autumn claim my attention. The sun formed a silver disk that I took to be a promise to power through the gloam. 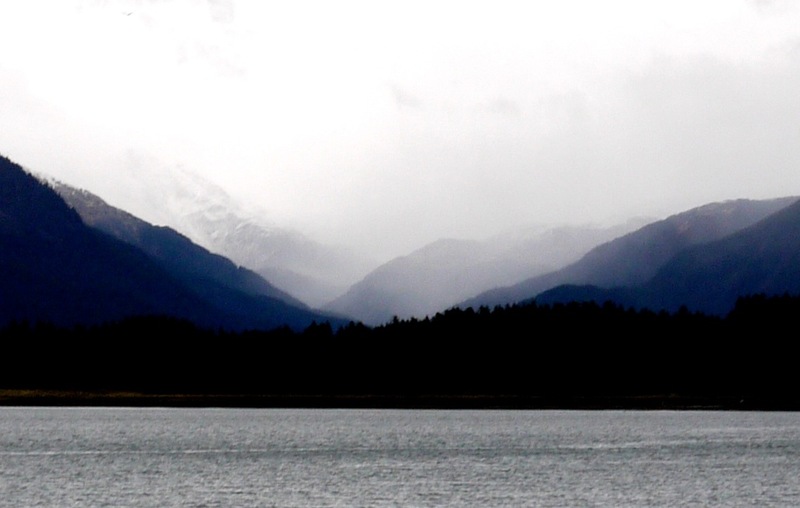 Across Favorite Channel, a snow covered sawtooth peak appeared for a minute. “It makes me sad,” the tall man said. “So sad.” He stood in the glare from the sun about to break through fog so I couldn’t see details of his face, just the rolled watch cap from which a long ponytail emerged. A sea lion exhaled after surfacing, making it hard to hear him explain that for the first time in many years there weren’t clams for harvest. I was too inside myself to ask why. 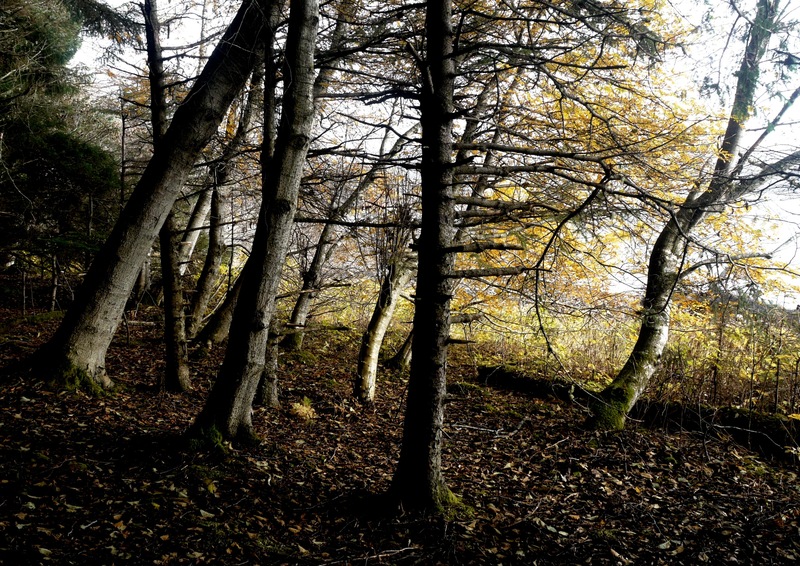 Something in the way he spoke—words used, pronunciation— suggested that he was of the Auk People who for many generations harvested clams on this point. Over my shoulder he could see their old village site. He could make out the areas once cleared for canoe haul outs just above a beach covered with dog tracks. As he left the silver disk of sun vanished, returning us to the grey. Promise broken. Aki and I left the beach just after crossing in front of the old village site and took a trail through old growth. The returning fog silenced the ducks but we could still hear the song of a gull, sad enough to be the village’s lament. 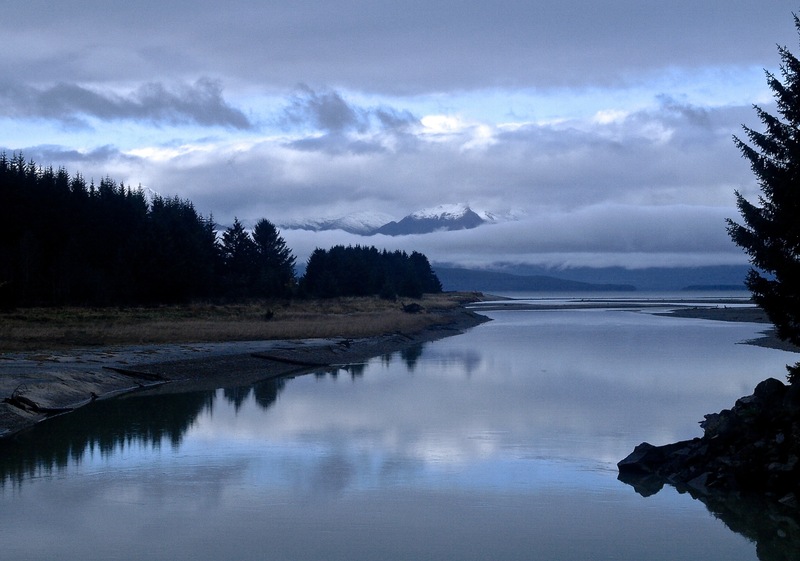 This entry was posted in Aki, Dan Branch, Juneau, Kwethluk, Nature, Southeast Alaska on October 25, 2014 by Dan Branch. Fog drew me here. 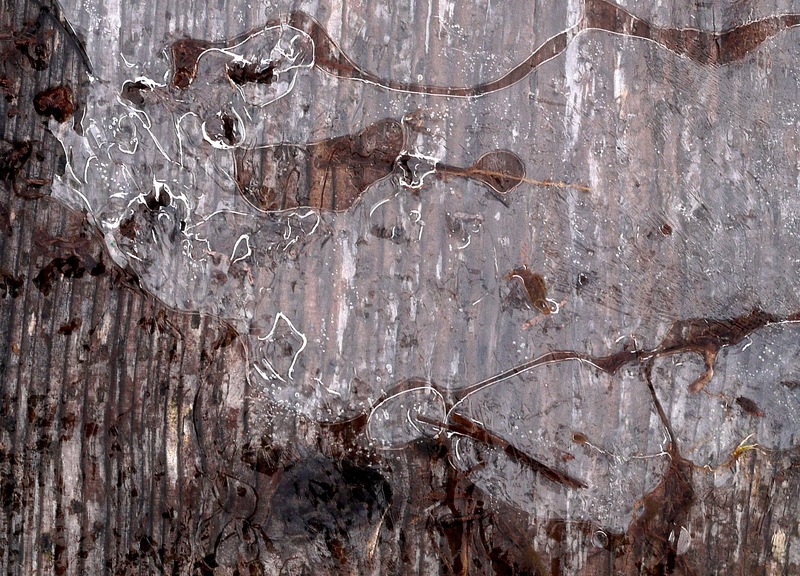 But we were turned back by ice. 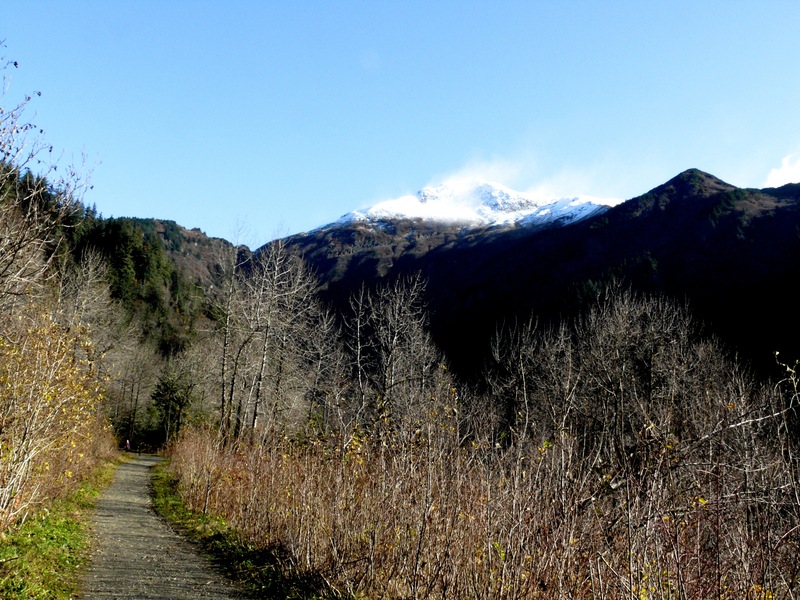 The trail took us along the old Treadwell water ditch and then onto a boardwalk that climbs into the Dan Moller Bowl. Even though the mining machinery the ditch once served closed almost 100 years ago, it still holds water. Pale, teardrop shaped leaves contrived to form a single line around the edge of one of the ditch’s narrow ponds. They also circled a willow island. Only the teardrop tops touched the island. 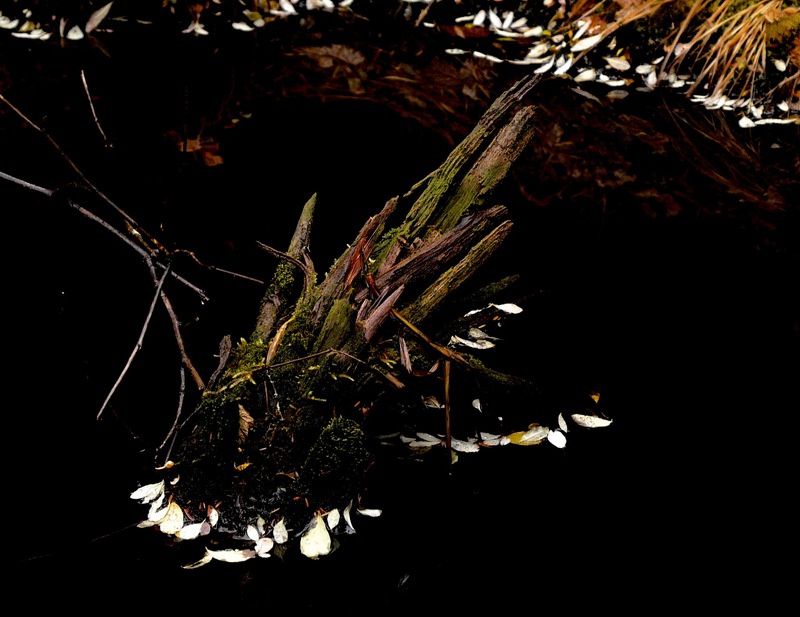 The central vein of most leaves formed a 90-degree to the willows. It is hard to believe that gravity, wind, and current alone placed the leaves with such geometric precision. 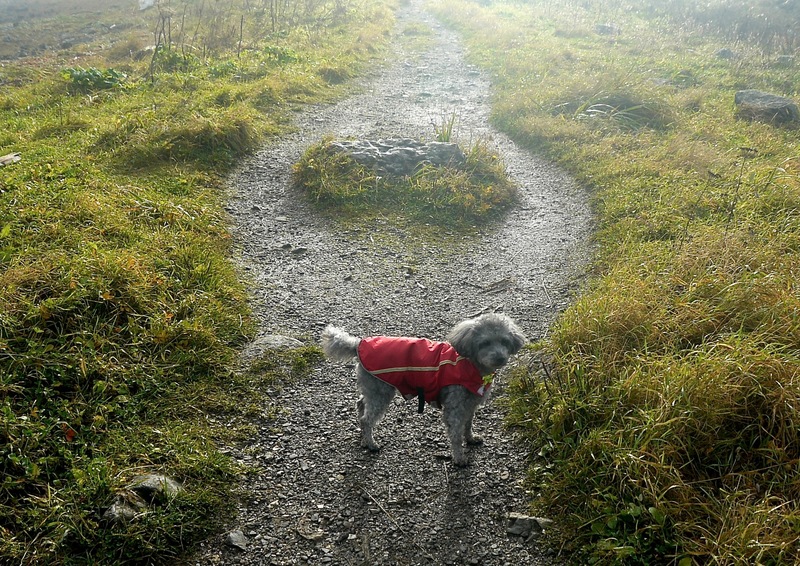 This entry was posted in Aki, Juneau, Kwethluk, Nature, Poodle, Southeast Alaska on October 23, 2014 by Dan Branch. We could have picked a better day for it. With wind smashing rain against the house, Aki and I mount up for a wracking expedition. It’s something we do every fall, like picking berries or raking leaves. The seaweed we collect will protect our perennials from hard freezes. Next spring it will enrich our compost. Like a child left with an inattentive father for the day, Aki entertains herself on the beach. She sniffs and pees, sniffs and pees, then noses a full collection bucket. Finding nothing of interest there, she searches the beach for a fun distraction. I carry two of the heavy buckets up a steep path to the car. Aki follows at my heels and appears more than willing to jump in and wait for me to fetch the other buckets. Did I mention the pouring rain? Chores done, I drive to the end of North Douglas Island and lead Aki through a swamp full of nonproducing lingon berries to another beach.. “This is just for fun little dog.” The sun muscles out from a cloudbank and partially blinds us with reflective glare. We stand at the edge of a rock shelf just above diminutive surf. 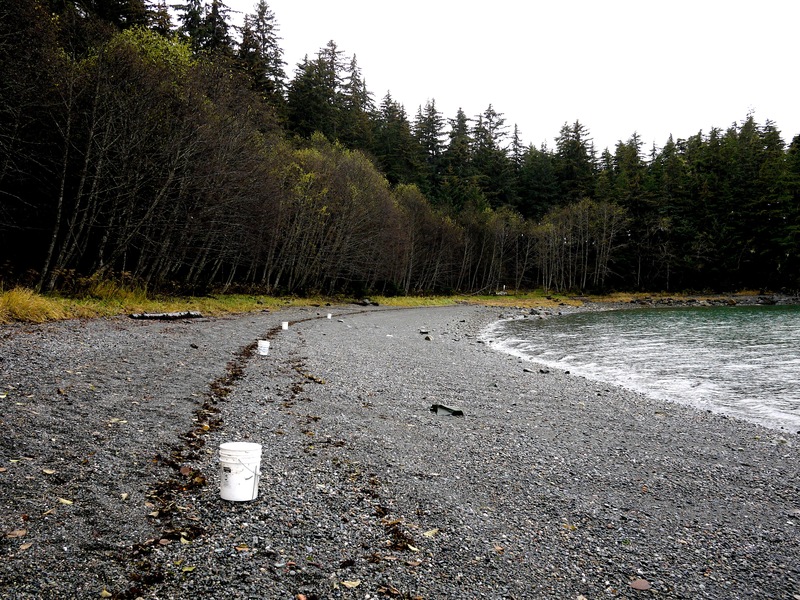 We have sun and the comforting sound of breaking waves; the beauty of Admiralty Island partially shrouded in clouds and four buckets of wrack stored back at the car. 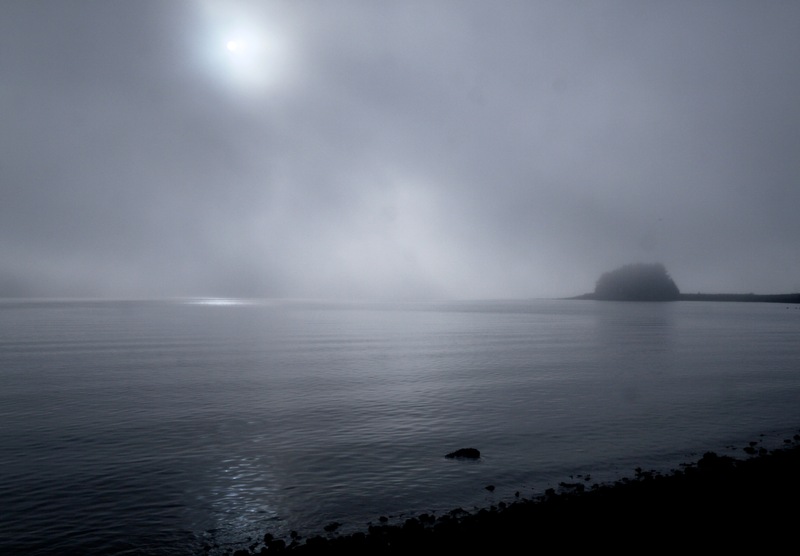 This entry was posted in Aki, Dan Branch, Juneau, Kwethluk, Nature, Southeast Alaska on October 22, 2014 by Dan Branch.